It’s a new year, and time for a new book! I’ve loved nearly everything we made from Sky High : Irresistible Triple-Layer Cakes, and I’m looking forward to baking from Southern Cakes : Sweet and Irresistible Recipes for Everyday Celebratons. Because you don’t always have an immediate outlet for a sky-high cake, you know? Coffee Cake, though – I can peddle that anywhere. It’s practically healthy. This recipe, I altered. Couldn’t find raisins anywhere, but did find dried cranberries from Trader Joe’s. Also, have inexplicably run out of pecans; substituted walnuts. All else the same. I think, were I doing it again, I’d go ahead and make the crumble instead of layering the ingredients separately. The butter dribbled around weirdly and ended up making odd shapes. The taste is fine, but it looks funny. The topping ends up nicely crunchy and caramelized, the cake moist and fluffy. The rest disappeared rather quickly at work this morning, so I can’t report on how it holds up over a few days, but I hear it does well. See? weird bobbles of cake. Heat the oven to 350 degrees F. Grease and flour a 13 by 9 inch pan. To make the filling, combine the light brown sugar, flour and cinnamon in a bowl and stir with a fork to mix everything well. Combine the raisins and pecans in another bowl and toss to mix them. Place the cinnamon mixture, nut mixture and melted butter by the baking pan to use later. To make the cake batter, combine the flour, baking powder and salt in a bowl. Stir the vanilla into the milk. In a large bowl combine the butter and sugar and beat with a mixer on high speed until pale yellow and evenly mixed, about 2 minutes. Scrape down the bowl to ensure a good mix. Add the eggs and beat for another 2 minutes, scraping down the bowl now and then, until the mixture is smooth and light. Bake for 45 to 50 minutes [I’d check sooner – mine was quite very well done at 45 minutes], until the cake is golden brown, fragrant and beginning to pull away from the edges of the pan. Place the pan on a wire rack and allow to cool in the pan for 5 to 10 minutes before serving in squares right from the pan. The cake is delicious hot, warm or at room temperature. It’s been a few months since I’ve managed to make the CSB cake, but I’m back on track! This month’s cake presented some challenges. The cake recipe itself came out very moist, almost wet – which made it a bit of a handful to work with while decorating. The white chocolate mousse failed entirely the first time around (mostly because I misread and added all of the cream to the chocolate – hence the white chocolate ‘sauce’ you’ll see in a later pic), but I made a milk chocolate mousse the second time around (being out of white chocolate) and it was still really soft – the extra chocolate liqueur should have helped it hold up more, but others reported soft mousse as well, so if I were making this again I’d use some other mousse recipe. The frosting came out fine, although it took longer to set up for the final coat than I’d like, and it was un-pipeable. I wanted to do something more interesting for decoration, but it really wasn’t going to happen with this frosting. The taste was great, though – the cake was soft and flavorful, the frosting was dense and fudgy, and the mousse had soaked into the layers enough to make nice gooey mess. Incredibly rich – I’ve had two parties now with this cake and still have some left over. Help! 2. Set third layer on top and pour half the sour cream chocolate over the filled cake. Spread all over the sides and top. Don’t worry if cake shows through. 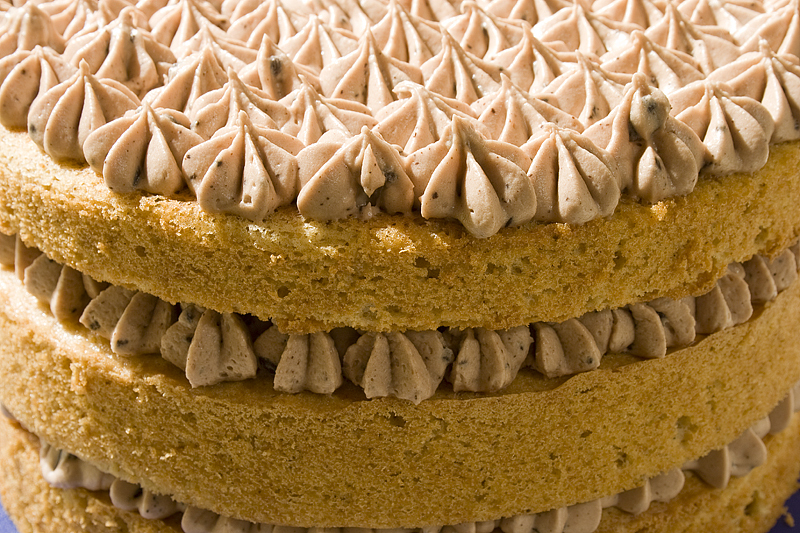 The first frosting is to seal in the crumbs which is whey professinal call it a “crumb coat”. Refrigerate cake uncovered for at least 30 minutes to allow the icing to set. Cover the rest of the icing and set aside at room temperature. I have a confession to make. I didn’t take a picture of this cake. I was in such a hurry this morning to finish it up and get it out the door to the cafe (now open! ), that I forgot, and I forgot to take my camera along as well. It was greeted with pleasure, though – I had it up on the cake stand for all of two or three minutes before the first order for it came through, so I got to cut the first slice. It looked fabulous! And I can say from the scraps that the cake itself tasted wonderfully coconutty, and that the frosting complemented it well. Although, as for the frosting – I have a confession to make there as well. Italian buttercream (made when you whip a hot sugar syrup into egg whites) continues to elude me. Seems no matter how many times I try to make it, I always end up with calcified sugar lumps in a buttercream frosting. So after the first failure, I gave up and just made a stiff meringue the regular way (with egg whites and sugar). I do hereby vow to spend a day trying to get it right, though. Any tips? (I already know not to drizzle it in while the mixer’s running or I end up with spun sugar, been there, done that) I suspect that I’m heating the syrup too much, although with today’s recipe the quantity was so small that it blew through soft-ball and evaporated nearly entirely in about 2 seconds, once it passed 110F. Yow! Don’t know how to keep that from happening. So here’s a picture of Dorie’s Picture Perfect Party Cake, which looks a lot like the one I made today on the outside, although you should imagine no raspberries, a bigger sprinkle of coconut on the top center, and balls of frosting around the top edge (as a guide to serving size for the cafe). To see how the other folks among the Cake Slice Bakers fared, check them out! 1.Preheat the oven to 350F degrees. Butter the bottoms of three 8-inch round cake pans. Line the bottom of each pan with a parchment circle and butter the circle. 2. Put the egg whites in a bowl and whisk slightly. Add the ½ cup of milk and the vanilla and whisk to mix thoroughly; set aside. 3.In a large mixer bowl, combine the flour, sugar, baking powder, and salt. With the mixer on low, beat dry ingredients well in order to break up any lumps. Add the butter and coconut milk on low speed and beat just to combine. Raise the speed to medium and beat until light and fluffy about 2 minutes. 4.Add the egg white mixture in 2 or 3 additions, scraping the sides of the bowl after each addition. Divide the batter among the pans. 5. Bake for 30 minutes or until a cake taster inserted in the middle comes out clean. Allow the cakes to cool in their pans for 10 minutes. Then turn the cakes out and place on a wire rack to cool completely. 6.To assemble the cake, place one layer, flat side up, on an 8-inch cake round. 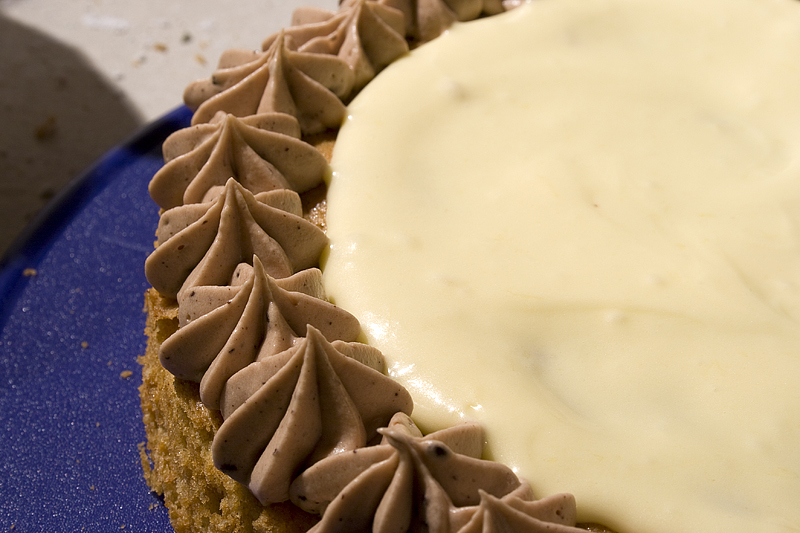 Cover this layer with 1 cup of the buttercream frosting. Spread it evenly all the way to edge of the cake. Then sprinkle ½ cup of shredded coconut on top. Add the second layer and repeat the process. Top with the final layer of cake and frost the top and sides of the cake. 7.Place the remaining 1 ½ cups shredded coconut on a large baking tray. Pick up the cake and hold it on the palm of one hand over the tray. Using the other hand scoop up the coconut and press it to the sides of the cake. Continue with this process until the sides of the cake are covered. Set the cake on a serving plate and sprinkle any remaining coconut on top of cake. Chill cake for at least one hour to allow frosting to firm up a bit. 1. Place the cream cheese in the bowl of a mixer and beat on medium speed until slightly fluffy and smooth. Add the butter 1-2 tablespoons at a time, mixing until smooth. Add the confectioner’s sugar and vanilla and mix until fluffy. Set aside at room temperature while buttercream is made. 2.Combine the granulated sugar and water in a small heavy saucepan and bring to a boil over medium heat, stirring to dissolve sugar. Continue to cook without stirring until the syrup reaches the softball stage 228 degrees F on a candy thermometer. 3.Meanwhile, place the egg whites in mixer bowl and have the mixer ready to go. When the syrup is ready, turn the mixer on med-low and begin mixing the egg whites. Slowly add the hot syrup to the whites taking care not to pour onto the beaters, it may splash. When all the syrup is incorporated, raise the speed on the mixer to med-high and beat the egg whites until mixture has cooled and stiff meringue forms. 4. With the mixer on low, begin adding the cream cheese mixture by the spoonful. 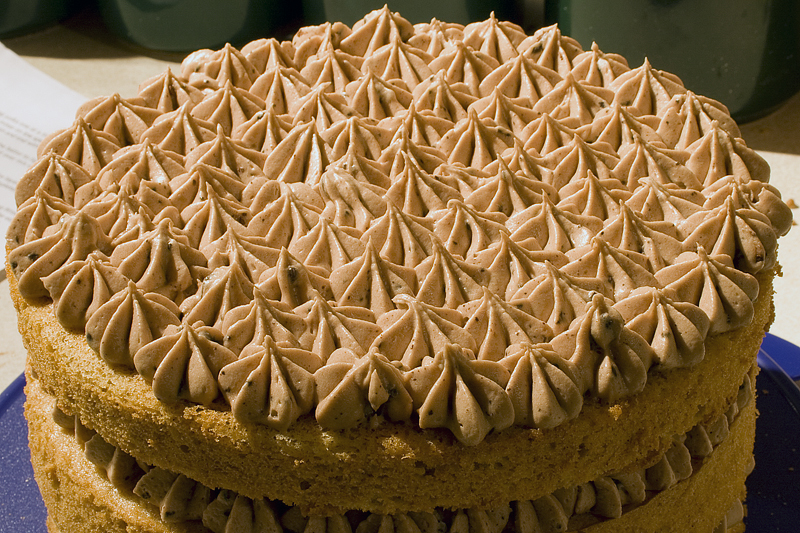 When all is incorporated, raise the speed to medium and whip until frosting is smooth and fluffy. So, last week was when this cake was due (check out everyone else’s!). And I had baked it! And photographed it, even. But the pictures didn’t get edited, and we went out of town, and, and, and… so it’s a bit late. But still tasty! The banana cake came together like a dream – easy to make, smells fabulous, tastes great. I did my usual ‘cut the recipe in half and use three 6″ pans’ trick so as to not end up with miles of cake. I used walnuts for the praline instead of pecans, and made it by melting sugar and coating, rather than the boil/fry method the recipe calls for. It was fabulously tasty, and I think walnuts go better with banana anyways! The white chocolate ganache… Jeff loved it. Said it was fabulous. To me, it tasted way, way too sweet, but I’ve been off sugar for two weeks now and my taste receptors are changing 😦 The cake was a little plain when I’d frosted it, so I covered the sides with leftover praline, and spun some sugar for a topper (I still need practice with that bit – lots!) I still strongly dislike working with whipped cream frostings. It’s just not smooth. Check out my fabulous sugar! 1. Preheat the oven to 350F degrees. Butter three 9-inch round cake pans. Line the bottom of each pan with parchment paper or wax paper. 2. Sift together the flour, baking powder, cinnamon, and salt. Set aside dry ingredients. In a food processor or blender, process the milk and banana into a smooth light puree. Set aside. 3. In a large bowl cream together the butter and sugar until light and fluffy. On medium high speed, beat in egg whites 2-3 at a time until smooth. Scraping down the sides of the bowl between egg additions. 4. With the mixer on low speed add the dry ingredients and banana puree alternately in 2-3 additions, beating until just blended. Scrape down the sides of the bowl and beat on medium-high speed for 1-minute. Divide the batter among the cake pans. 5. Bake for 20-25 minutes or until a cake tester comes out clean when inserted into the center of each cake. Let the cake layers cool in the pan for 10 minutes. Then turn out onto a wired rack and remove the paper liners. Then cool completely one hour. 6. To assemble the cake, put one layer, flat side up, on a cake stand or serving plate. Cover the top evenly with half of the praline filling, leaving a 1/4″-inch margin around the edges. place the second layer on top, again flat side up, cover it with remaining filling. Finally add the third layer and frost the sides and top with the white chocolate ganache. Garnish with sugared pecans. 1. With a large chef’s knife chop the pecans. Or pulse in a food processor being careful not to turn into paste. 2. Add the sugared pecans to the white chocolate ganache and stir to mix well. 2. While the nuts are draining, heat the oil in a large heavy saucepan or deep fat fryer t0 350F degrees. 3. Set half of the nuts aside. Dust the remaining nuts in the sieve with 1/2 cup of powdered sugar. Shake the sieve to coat the nuts evenly, letting any excess sugar fall away. Immediately add the coated nuts to the hot oil. Fry until golden brown about 2-3 minutes. Using a slotted spoon scoop the nuts out and drain them on several thickness of paper towels. Repeat the process with the remaining nuts. 1. Place 1/4 cup sugar in a saucepan over medium-high heat and heat until melted and dark amber in color. 2. Add walnuts. Stir to coat, sprinkle with another 1/4 cup of sugar. 3. When the new sugar has melted, add another 1/4 cup. Repeat with last 1/4 cup. 4. Turn out onto non-stick, melt-proof surface (such as a silpat). 5. When cool, chop into small pieces. 1. Put the white chocolate in a medium heat proof bowl. In a small sauce bring 1/2 cup of the cream to a boil. Pour the hot cream over the chocolate. Let stand for 1-minute, then whisk until smooth. Let the white chocolate cream stand until cooled to room temperature. 2. In a chilled bowl with chilled beaters beat the remaining 2 cups of heavy cream and vanilla until softly whipped. Stir in the white chocolate cream and beat until fairly stiff. taking care not over beat, which would cause the ganache to separate. Late afternoon sun on spun sugar. Every month, the Cake Slice Bakers take a recipe from the year’s chosen cookbook (currently Sky High : Irresistible Triple Layer Cakes, by Huntsman & Wynne) and bake it up for your delectation. I did have some quibbles with the way the recipe was written – when someone tells me to “bake 12 ounces of sweet potatoes, peel, puree, and set aside one cup for later”, I expect that the first time the recipe calls for sweet potatoes I’m using the part that didn’t get set aside, which is what I did. However, ‘later’ never came – after I’d baked the cakes and was making sure I had everything ready to put the frosting together, I noticed that I still had a forlorn-looking cup of sweet potato puree sitting on the counter. “Hmm,” says I. I re-read the recipe. No further sweet potato usage. Checked it twice, even. Nope. The part I used was about the same quantity, thankfully, but it could have been something of a wreck, there. Why the weird white blotches? Butter and cream cheese played nicely together, but when I added the (melted, now room temperature) chocolate, instead of melding nicely it froze up solid into little chunks. So we shall pretend that we meant it that way, neh? It’s so pretty with its little flecks, is it not? The icing, already sort of soft, did not get any firmer when adding 2 TB .25 tsp worth of liquid to it, oh no. Another cup of powdered sugar and I could be fairly certain that it wouldn’t explode its little buttercream boundaries and go all over everywhere, but barely. The first layer came out beautifully! It was so pretty I thought about just making three cakes, but decided to continue. I toyed with the idea of not frosting the sides, letting the natural beauty of my little stars shine through, but remember that soft icing? As soon as I put the second layer on, it squished something fierce. Taste-wise? So far I’ve only had the frosting – the cake itself is going to a volunteer appreciation dinner tomorrow night (it barely, barely fit into my cake carrier – whew!). The frosting is really sweet, and the combination of really sweet cream cheese and unsweetened chocolate just clashes, to my mind. The orange was tasty, but again, so achingly sweet. Shall report back when I find out how it all tastes together! 1. Preheat the oven to 400F degrees. Prick the sweet potatoes in 2-3 places, place on a small baking dish and bake for 1 hour or until the potatoes are very soft. Remove from the oven and cool slightly. 2. Reduce the oven temperature to 350F degrees. Butter the bottoms and the sides of the pans and line with parchment paper. Butter the parchment paper also. 3. When the sweet potatoes are cool peel off the skin and remove any dark spots. Cut the potatoes into chunks and puree in a food processors. Puree until smooth. Measure out one cup of potato puree and set aside [to use in just a minute :)]. 4. Sift the flour, baking powder, cinnamon, nutmeg, and ground cloves. Set aside. 5. In the bowl of electric mixer add the egg whites and attach whip attachment. Beat on medium speed until egg whites are frothy. raise the speed to high and gradually beat in 1/4 cup of sugar. Continue to beat until the egg whites are moderately stiff. 6. In another large bowl with the paddle attachment, combine the sweet potato, butter, vanilla, and remaining sugar. Beat until light and fluffy. Add the egg yolks one at a time. Make sure to scrape the sides of the bowl after each egg yolk is added. With the mixer on low speed, add the dry ingredients and milk in alternately in 2-3 additions. making sure to begin and end with the dry ingredients. 7. With a large spatula, fold in one fourth of the egg whites into the batter to lighten. Then fold in the remaining egg whites until no streaks remain. Making sure to not over mix or this will deflate the batter. Divide the batter among of the three pans. 8. Bake for 25-30 minutes or until a cake tester comes out clean. Let the cake layers cool in the pan for 10 minutes. Then turn out the cake layers onto a wire rack and cool completely at least 1 hour. 9. 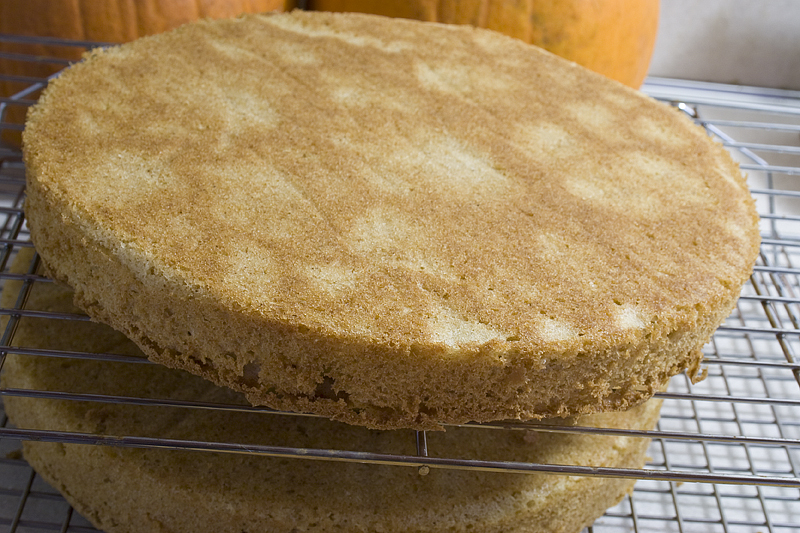 To assemble the cake, place one layer flat side up on to a cake stand. With a pastry bag fitted with a 1/2 inch round tip and filled with chocolate cream cheese icing, pipe border around the edge of the cake. Fill the center with the orange cream filling smoothing it to the edge of the border. Place the second layer on top and repeat the process.Place the third layer on top and use all the chocolate cream cheese frosting to cover the top and sides of the cake. 1. In a large mixing bowl, beat together the cream cheese and butter until fluffy. Slowly add the powdered sugar to cream cheese butter mixture. Making sure to scrape down the sides the sides of the bowl. Then beat until light fluffy 2-3 minutes. 2. Measure out 1 cup of frosting and set aside. 3. Add the melted chocolate to the remaining icing in the bowl and beat until well combined. If your chocolate seizes all up and therefore your icing isn’t chocolate-colored, add some cocoa powder, about a tablespoon. 1 cup of reserved cream cheese icing from above. 1. Stir together all the ingredients until well mixed. If it’s a runny, gloppy mess, add more powdered sugar until it isn’t.